Well-known fair housing and fair lending activists and organizers examine the implications of the new wave of fair housing activism generated by Occupy Wall Street protests and the many successes achieved in fair housing and fair lending over the years. The book reveals the limitations of advocacy efforts and the challenges that remain. Best directions for future action are brought to light by staff of fair housing organizations, fair housing attorneys, community and labor organizers, and scholars who have researched social justice organizing and advocacy movements. The book is written for general interest and academic audiences. Contributors address the foreclosure crisis, access to credit in a changing marketplace, and the immoral hazards of big banks. They examine opportunities in collective bargaining available to homeowners and how low-income and minority households were denied access to historically low home prices and interest rates. Authors question the effectiveness of litigation to uphold the Fair Housing Act's promise of nondiscriminatory home loans and ask how the Consumer Financial Protection Bureau is assuring fair lending. They also look at where immigrants stand, housing as a human right, and methods for building a movement. Chester Hartman is an urban planner, academic, author of more than twenty books, and director of research for the Poverty & Race Research Action Council. Gregory Squires is a professor of sociology, public policy, and public administration at George Washington University and advisor to the John Marshall Law School Fair Housing Legal Support Center. 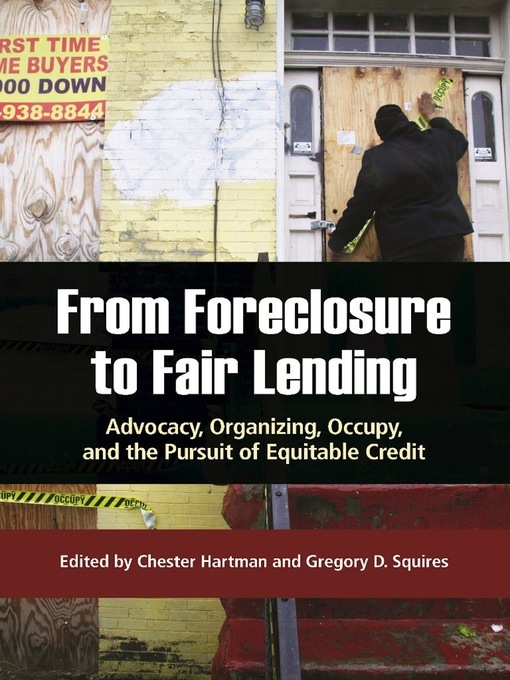 This book addresses important issues of the Occupy protest movement for fair lending, fair housing advocacy, and equal opportunity.